Launched by Sodexo and Starship Technologies, Mason’s 40,000 students, faculty and staff can access the Starship Deliveries app (iOS and Android) to order food and drinks to be delivered anywhere on campus, within minutes – at a cost of $1.99 per delivery. 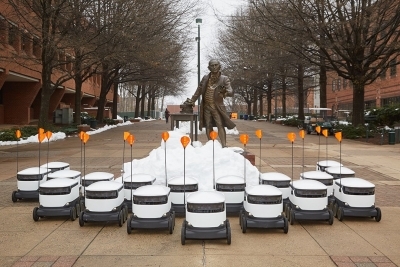 With a fleet of more than 25 robots at launch, this initiative is the largest implementation of autonomous robot food delivery services on a university campus. To get started, users open the Starship Deliveries app, choose from a range of their favourite food or drink items, then drop a pin where they want their delivery to be sent. They can then watch as the robot makes its journey to them, via an interactive map. Once the robot arrives, they receive an alert, and can then meet and unlock it through the app. The entire delivery usually takes 15 minutes or less, depending on the menu items ordered and the distance the robot must travel. Each robot can carry up to 20 lbs – the equivalent of about three shopping bags of goods.